The transverse flute was one of the most popular instruments in the second half of the 18th century, in particular among amateurs, the so-called 'Liebhaber'. In consequence, there was a huge demand for music for the transverse flute, and as a result we see a large production of chamber music with flute. Haydn didn't compose much for the transverse flute. The four trios recorded here were written during his second visit to England in 1794 and 1795. It is thought that at least some of them were specifically written for two aristocratic friends of his, the Earl of Abingdon and the Baron of Aston. In the first print of Trios 1 and 2 both gentlemen are mentioned as addressees. The Earl of Abingdon was the addressee of the second trio: he was an avid flute player and composer, and the andante of this trio uses one of his melodies: 'The Lady's Mirror'. Although this music was written for, and therefore expected to be played by, the above-mentioned aristocrats, this doesn't mean these pieces are that easy. They show that the playing skills of the 'Liebhaber' in those days were considerable. Composing and publishing music for the flute was also a way to increase someone's income. Carl Stamitz, once a key figure of the so-called 'Mannheim School', was without a steady job at the time the pieces played here were published, in 1785. He just travelled around playing and teaching. In those years he could be found in many places in Europe including Strasbourg, St Petersburg, Berlin and also London. Being a violinist by profession the transverse flute wasn't his main interest, but writing music for the growing number of people looking for new repertoire for their favourite instrument was a way to increase his income. But it didn't prevent his belongings being auctioned after his death to pay for his debts. Although all the music on this disc belongs to the category of entertainment, the best composers of the time were eager to probe beneath the surface now and then. In Haydn's Trio in C the final movement contains a chromatic passage which represents a 'passus duriusculus', a baroque rhetorical figure expressing sadness. And the middle movement (andante poco moderato) of Stamitz's trio contains a dark passage in C minor. 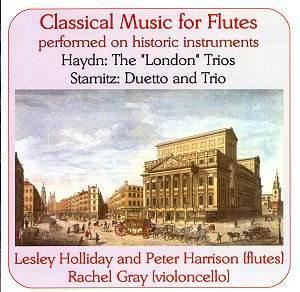 The trios by Haydn are rather well-known and available in other recordings. Here they get a good performance, although sometimes I would have wanted the tempi a little brisker and the articulation a little sharper. The main interest of this disc is in the pieces by Stamitz, which - as far as I know - have never been recorded before, certainly not on period instruments. And considering their qualities, which are eloquently demonstrated by the interpreters, they are well worth listening to.